Go on an amazing visual journey through the animal kingdom with Animal and find out all about over 2,000 species from tiny elephant shrews to great baleen whales. 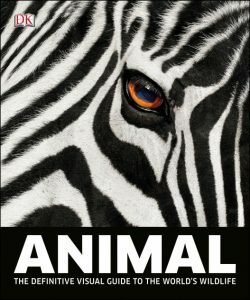 Written by a team of over 70 zoologists and naturalists from around the globe the book has sold over one million copies worldwide and the new edition has been fully revised and updated to reflect changes in the animal world. As well as important updates on the distribution, population and conservation status of many animal groups this new edition includes more breathtaking photography and 50 new species that have been discovered since Animal was first published 10 years ago. Such exciting creatures as the tube-nosed bat, ghost slug and the remarkable yeti lobster are now featured to name just a few. Perfect for all the family, essential for nature students and conservationists everywhere – Animal is a classic for a new generation. The book’s beautiful flocked cover, made to look just like a real zebra, also makes it the perfect gift. Artist/Author: Garbutt, Nick, and Daniel Austin. 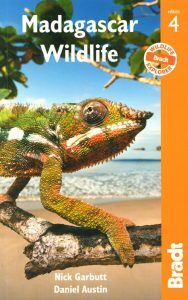 Lavishly illustrated and completely updated, this fourth edition of Bradt’s Madagascar Wildlife is a celebration of the island’s extraordinary flora and fauna, over 80 per cent of which is endemic. The pace of change in Madagascar’s biodiversity is staggering, over the past decade a new species of frog has been discovered at a rate of one every six weeks, and this is the only guide to keep abreast of such scientific developments. Containing over 280 colour photographs, updated information on 22 of the country’s top parks and reserves, plus lively species descriptions, this handbook is perfect for natural history enthusiasts and travellers alike. Artist/Author: Spawls, Stephen and Glenn Mathews. For its size, Kenya probably has the most diverse range of habitats of any country in Africa, if not the world. Within its borders there are alpine peaks, montane forests, high plateaux, savannas, lowland forests, coastal woodlands and wetlands, and a string of varied lakes in the Great Rift Valley. The range of wildlife to be found in the region is correspondingly diverse. 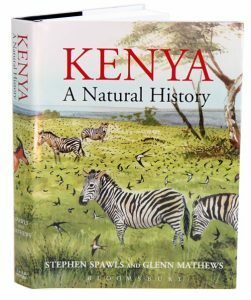 This book explores the wildlife and habitats in great detail and gives a thorough overview of Kenya’s natural history. Animals of the Masai Mara. A photographic guide featuring the wildlife most likely to be encountered by a safari visitor to the Masai Mara National Reserve in Kenya. Over 140 stunning photographs showcase 65 mammals and 17 reptile species, including 6 snakes. Designed to be informative and locally accurate, rather than purely identification-based, this easy-to-use book pays particular attention to wildlife behaviour and is written from the firsthand experiences of the authors and the knowledge of local safari guides. Numerous “Top Tips” throughout show readers how and where to locate specific species. 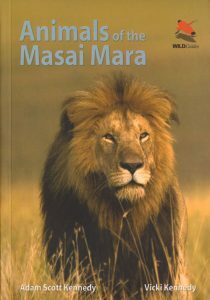 The only field guide to focus solely on the wildlife of the Masai Mara National Reserve, this guide will be indispensable to visitors to this famous park and all nature enthusiasts with an interest in this area of the world. Artist/Author: Withers, Martin and David Hosking. The perfect companion for the safari enthusiast, this complete traveller’s guide to the wildlife of Namibia, Botswana, Zimbabwe, South Africa and Malawi is a must-have for all those considering a trip to the game reserves of this highly popular region. 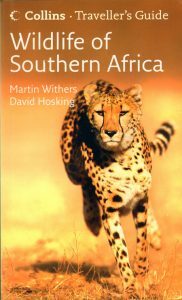 Written and illustrated by wildlife experts who have been leading safaris in the region for over 20 years, and featuring over 400 species of bird, mammal, reptile, amphibian and insect, this informative guide makes the perfect companion for all those considering a trip to the game reserves of southern Africa. Each species is illustrated with a full-colour photograph and features a full species description. Key information on wildlife photography is also included, such as the best type of camera, film and lenses to use, along with information on techniques and codes of conduct. Whatever you do, don’t run: my adventures as a Botswana safari guide. 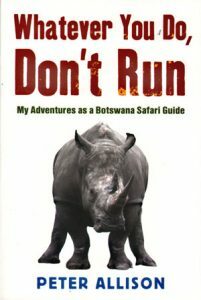 A hilarious, highly original collection of essays based on the Botswana truism: only food runs! Allison presents the guides-eye view of living in the bush, confronting the worlds fiercest terrain of wild animals, and managing herds of gaping tourists. See also [stock id 30171]. Don’t look behind you, but: more tales from an African safari guide. 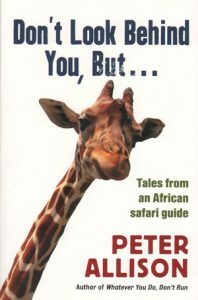 Our favourite safari leader is back with more hair-raising, incredible and laugh-out-loud funny tales from his time guiding unsuspecting tourists through the African bush. 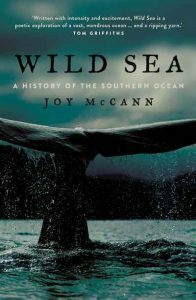 Drawing on his experiences in South Africa, Botswana, Mozambique and Namibia this book picks up where Whatever you do, don’t run left off. See also [stock id 30187]. 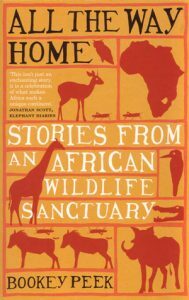 Stories from Stone Hills Wildlife Sanctuary in Zimbabwe. See also stock id . Serengeti three: human impacts on ecosystem dynamics. Artist/Author: Sinclair, A.R.E. et al, editors. Serengeti National Park is one of the world’s most diverse ecosystems, a natural laboratory for ecology, evolution, and conservation, with a history that dates back at least four million years to the beginnings of human evolution. 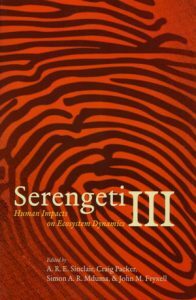 The third book of a groundbreaking series, “Serengeti III” is the result of a long-term integrated research project that documents changes to this unique ecosystem every ten years. Bringing together researchers from a wide range of disciplines – ecologists, palaeontologists, economists, social scientists, mathematicians, and disease specialists – this volume focuses on the interactions between the natural system and the human-dominated agricultural system. By examining how changes in rainfall, wildebeest numbers, commodity prices, and human populations have affected the Serengeti ecosystem, the authors conclude that changes in the natural system have affected human welfare just as changes in the human system have affected the natural world. 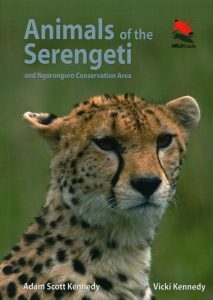 To promote both the conservation of biota and the sustainability of human welfare, the authors recommend community-based conservation and protected-area conservation., “Serengeti III” presents a timely and provocative look at the conservation status of one of earth’s most renowned ecosystems. Artist/Author: Ross, Mark and David Reesor. A guide to the predators of the African bush. 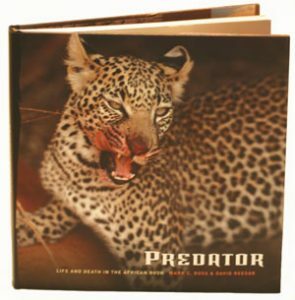 Each chapter is devoted to a predator – lions, cheetahs, leopards, hyenas and crocodiles – and delves into their biology and behaviours, how and when to observe them, facts and statistics. It also features photos that show both common and rarely seen behaviours.